Your tax refund is the amount of money you can expect to receive from the Internal Revenue Service (IRS) or your state tax authority after you file your return. 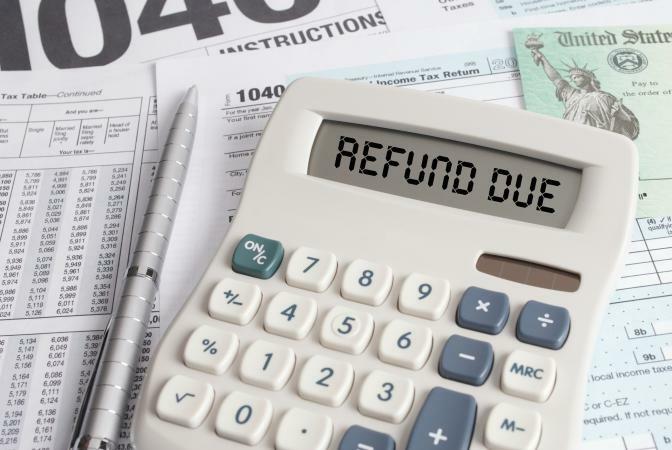 A refund results when the amount of taxes you have paid in advance, along with tax credits for which you are eligible, exceed your tax liability. The process of estimating the amount of your federal and state tax refunds is similar. For starters, you will need to gather documentation of your taxable income for the year. This includes salary, commissions, bonuses and so on from your job, money received from renting out property, gains on investments, gambling winnings, unemployment benefits and so on. Child support, workers' compensation benefits, gifts, income from scholarships, and welfare benefits are not taxable and do not need to be included in this total. It is important to include your earnings for the entire year because your tax liability and refunds are calculated on a 12-month basis. Step 2: Itemize or Standard Deduction? If your itemized deductions add up to less than the standard deduction, you should take the standard deduction. Remember that some itemized deductions are subject to a 2% adjusted gross income (AGI) floor. That means that you first subtract deductions not subject to the floor from your taxable income, then calculate 2% of the income that's left over from those deductions that are subject to the floor. Whatever is left after subtracting the 2% AGI you can add to the other deductions to produce your total itemized deductions. If that all sounds too complicated, CNN's AGI calculator can do some of the math for you. Take your total income from step one and subtract either your standard deduction amount or the sum of the itemized deductions you calculated in step 2. Compare the result to the 2016 federal tax brackets listed below, and this will allow you to estimate your tax liability. Federal tax brackets usually change from year to year so check with the IRS annually before calculating your liability. Your state and federal tax brackets may differ, and not all states charge income tax. The Federation of Tax Administrators provides a list of state tax authorities organized alphabetically. Visit your state's site to find out the tax brackets for the state. Next, add together the value of any credits you're eligible to claim. 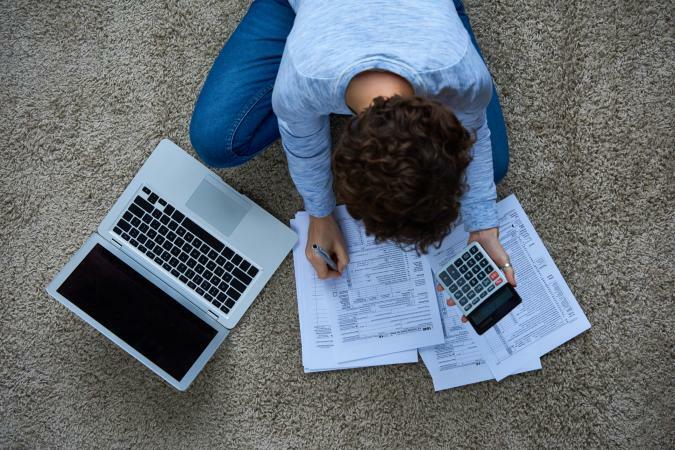 Tax credits are more valuable than deductions because you subtract credits from your tax liability, whereas deductions you subtract from your income before calculating your tax liability. Subtract your tax credits from the tax liability you calculated in the step 3. To determine the total amount of taxes withheld, you will need a pay stub and any other documents showing how much you have paid in taxes to date. Multiply this amount as necessary to cover the entire year. For example, if your employer withheld $200 from your last paycheck for taxes, and your paycheck was for a two-week period, your total withholding amount for a one month period is $400. Therefore, you would have paid approximately $4,800 in taxes ($400 x 12) over a twelve month period. Subtract the total taxes withheld you determined in Step 5 from your tax liability after credits as calculated in step 4. If the result is a negative number, that amount is what you overpaid in taxes and can expect to have refunded to you. Several companies offer free tax refund estimate programs. You will need to provide your filing status, age, and number of dependents, if any. You will also be asked to identify the types and amounts of income, deductions, and credits you are eligible to claim. The program will then generate the estimated amount of your tax refund. 1040.com Federal Tax Refund Estimator - This free refund calculator that includes common deductions and credits. TurboTax TaxCaster - This calculator shows a running estimate of your expected refund (or tax bill) as you proceed through the steps. H&R Block Free Tax Refund Estimator - You can save your results on this calculator and come back later to finish. Your Money Page State Refund Calculator - a very basic calculator, but includes options for every state that charges income tax. Free Tax USA - somewhat nicer than the previous calculator but you have to set up a (free) account to use it. Your estimate tells you whether you are overpaying your tax obligations. Financial expert Suze Orman states taxpayers should never receive a refund, because doing so indicates they paid more money than they owed. "In reality, a tax refund represents an interest-free loan that a taxpayer makes to the government," Investopedia adds. Use your estimate to gauge how much in taxes you are paying and how much you truly owe. If you anticipate receiving an extremely large refund, you might consider adjusting the number of exemptions you claim on your form W-4.